Our app, Reeftopia, is based on the real world problems facing The Whitsundays, to inform both tourists and locals on how their actions are impacting the reef. The objective of Reeftopia is to inform users on how to enjoy the reef responsibly. 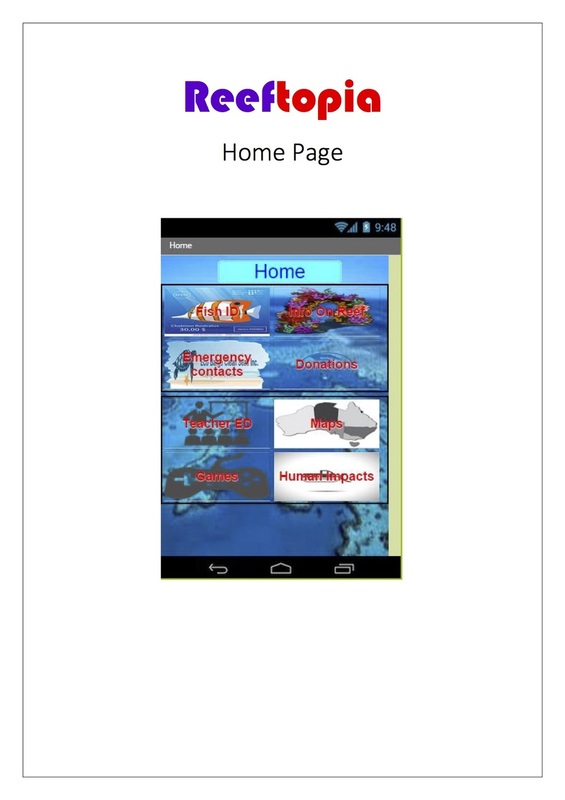 This app will include educational material, fish identification, donation, fishing maps, emergency contacts and human impacts. Educators will find Primary & Secondary resources & educational games. Local fisherman will benefit from government regulations on fishing zones & identifications of fish. Living, visiting and caring for The Whitsundays will be made easier, by accessing local information & helpful tips for enjoying the beautiful Great Barrier Reef. Our initial potential market size is made up of the two main groups of people in The Whitsundays, the locals and the tourist. The ever increasing trainset population of The Whitsunday Region was recorded in June 2013 approximately 35, 500 people. Research by Tourism and Events Queensland states the Whitsunday Region had 495,000 domestic visitors and 189000 overseas visitors in 2014. Reeftopia is also marketed to teachers and schools. Our survey showed teachers in the area did not have a clear understanding about how to protect The Great Barrier Reef. In The Whitsunday’s there are 19 schools and all would benefit from purchasing Reeftopia. Also any school within the world studying The Great Barrier Reef would benefit from buying Reeftopia. Reeftopia could potentially be purchased by anyone within the world who cares about protecting the Great Barrier Reef and the environment. These figures do not include schools in the area or around the world purchasing Reeftopia. Additional revenue could be made from anyone will cares about protecting the Great Barrier Reef.